This is the one and the only one represented method of all the Wu dang martial skill factions. It belongs to Wu dang Pure Positive faction. It is taught by Taoism man Liu Lihang, the great master of Wudang. The method has been taught one to one only from thousands of year ago. It is antiquity and classical. 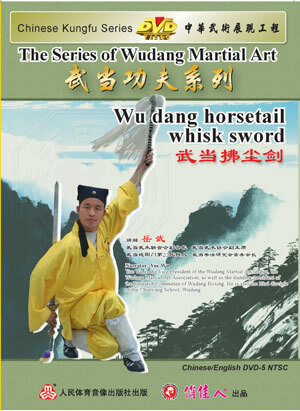 Wu dang horsetail whisk sword is take a sword in one hand and a horsetail whisk in the other. When practice is like a dragon swims and tiger steps. And at the same time have the guise of drunkard eight celestial beings. It is usually use in smelt elixir and practice Taosim, preserve one’s health and protect oneself. It is changeable when displaying, lightness, good looking, and uncommon.